Why Cavity Sliding door ? Telescopic Cavity Door System incorporates the same quality track and carriage system. That is use in all Premiums Sliding Doors Cavity Slider architectural units. Allowing the confident use of over-height and over-width wardrobe doors. Because the telescoping system hangs from the top track. There is no need inconvenient floor guides or tracks. Where the doors overlap a small floor guide fitted. This provides invisible and reliable guidance for each door. The gap between doors (when using a 38mm thick door) is 10mm. This may reduced to 7mm if a thicker door is (up to 41mm thick). 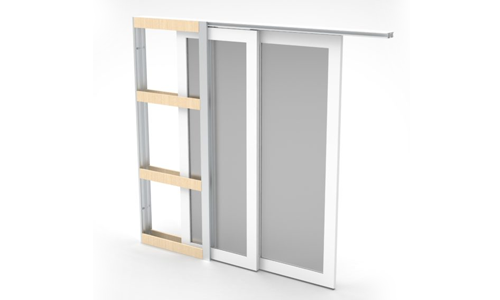 Cavity sliding doors and telescoping sliding doors can be supplied from the same joinery manufacturer. As the same standard thickness doors that suits our cavity sliding frames (35 – 41 mm thick) can be used in Double Telescoping Cavity Sliding Door. This uniformity ensures a consistent look between doors in a given area or throughout a building. Also incorporated with this unit are the closing jambs and head jambs, providing a simple and easy way to finish off wall linings. The top head jambs that cover the track and running gear are easily removable. Allowing access for servicing or door removal. Where a full height detail or square stopped look is important. These units may also supplied with no closing jambs and no head jambs. Minor assembly of the closing jambs to the track is require on site. Triple Telescoping 3 top track system also available.